It is Scotland's most endangered tree. But the Catacol whitebeam is not exactly making it easy for the scientists trying to secure its future. So much so that some might draw parallels with the notoriously reluctant to reproduce Giant Pandas, which have been tantalising keepers and visitors to Edinburgh's Zoo with their refusal to get frisky. The tree is the product of a complicated series of hybridisations between the rowan and the much-rarer rock whitebeam. I first saw it in Arran in the autumn of 2007, when there was one growing by a fast-flowing burn in a precipitous gorge in Glen Catacol. At that time there was precisely two specimens known in the world. Both in the north of the island. Scientists from the Royal Botanic Garden in Edinburgh (RBGE) pledged to protect them, and to collect seeds and grow more at their nurseries. In the intervening six years, one of the two trees in the wild has died. Making the conservation work even more urgent. "We did collect a lot of seeds", Dr Heather McHaffie, who is in charge of conservation of native Scots plans at the Botanic Garden, said. But, she ruefully admits: "Most of them had a little hole going in to the middle, because something had been in there eating them." Plan B was to graft Catacol whitebeam material on to rowan root stock. But those plants cannot be allowed out of the nursery because of the risk that the rowan would reassert itself, and overwhelm the graft. So the next idea was to "layer" the grafted trees. Effectively that meant tipping them on to the side, and burying them underground. The hope was that they would produce their own roots. But, so far, that hasn't worked either. By now, everyone was running out of options and things were starting to get a bit desperate. Until one expert, Hugh MacAllister who wrote a definitive guide to the mountain ash and other rowans, suggested taking cuttings. "Trees, we don't do by cuttings normally. And I was gob-smacked when I read that, perhaps, these would go," Neil Davidson admits. 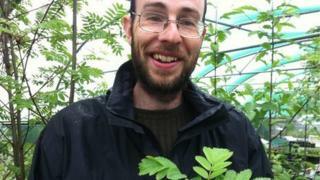 He has been in charge of cultivation at RBGE's nursery. But, despite his scepticism, last year they tried planting a small batch of just 20 Catacol whitebeam cuttings. And, he smiles, "one of them has worked". The rooted cutting does not look like much, to be honest. A small brown twig in a grey pot, with four or five shoots coming from the tip, each one bearing new light green leaves. But, Neil Davidson says, producing it successfully was a triumph. "It was probably the high point of my 2012", he says proudly, as he shows it off. "We had 20 cuttings. We had one success. So this year we took about 200 cuttings." The hope is that, if the ratio stays the same, they might get 10 which root successfully. "And if we get more, then I'll be very very happy indeed. 2013 will be even better than 2012," Neil Davidson says, rather wistfully. And scientists resist any suggestion that they are wasting time, working so hard to save a freak of nature, or an evolutionary dead end. Indeed the ultimate aim may be to use new trees grown in Edinburgh to boost the population on Arran, where they originated. Dr Heather McHaffie told BBC radio's Good Morning Scotland programme: "I think there will be some at a place on Arran where people can see them, and they can understand the story, rather than having to go up a steep and rocky glen." "But we don't just think 'oh that's a good idea, let's go and do it.' The landowner would have to be involved ... but also we have to discuss it with (the government conservation body) Scottish Natural Heritage." "It all has to be very carefully approved and discussed. And we do this ahead of doing any work." So it seems it could be some time before Arran's single surviving Catacol whitebeam is supplemented by Neil Davidson's cutting, or any other trees grown in Edinburgh.